Do you guys keep electronics in your workshop? a couple weeks again my DVR for my camera’s wont turn on anymore. i’m wondering if it has anything to do with all the dust from working in the shop. i do have dust collection piping set up, but i just recently noticed i have quite a bit of dust on my upper shelfs/ storage areas. Do you guys enclose your electronics somehow? I just purchased a Wen Air filtration unit, that hangs from the ceiling. Hoping that will help with my dust situation. Just wondering if i should mount it close to my electronics or on the other side of the shop. P.S. Working out of a 2 car garage. I have a lab top in mine, 2 car garage, no DC just a fan and the over head open. I close and cover the LT with a towel when WWing, No problems. I have cable tv, a dvd player, and my old boom box from way back when. The tv is on a 180 degree swivel mount so I can move it as needed. I try to stay on top of dc. I use 2 air cleaners and a box fan with a filter when necessary. I will take the dc hose to the tv and boxes occasionally. No problems, but it doesn’t just happen, I have to do it. I brought an older, cheap laptop into the garage. Died due to overheating very quickly. Undoubtedly due to dust blocking the cooling. (Laptops aren’t so easy to clean properly, either). A wake up call to get some proper dust collection happening. After I have that sorted out, I will get a used desktop and place it in a cupboard to keep it clean; with a wireless mouse/keyboard all you need is the power and monitor cables coming out. Need access to those youtube videos telling me how to do stuff. I have enough distractions to not include any electro gizmos. Pretty much you can assume any electronics with active cooling (fans) will just pull in tons of dust. Electronics have the unfortunate property of usually being electrically charged, which actively attracts dust to them. TVs are almost never cooled with fans, but even so they rely on convection currents to work properly and if the intake and outlet holes are covered over by dust then they’ll quickly die. 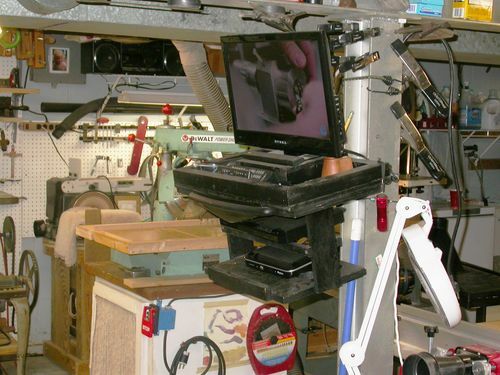 If you want to put a TV in a shop, you’re best off making a box around it out of sheet metal. Don’t put any holes in the box except a sealed grommet to pass the power cord in. Put a tiny desk fan or something inside to make air flow. The air will transfer heat to the metal box and provide cooling. EDIT: I should mention, you can either use a plexiglas cover in front of the TV screen, or you can cut a hole the same size as the actual screen (not including the plastic bezel), and use some foam weatherstripping so that the TV presses against the weatherstripping and this will prevent dust from getting in. TVs are almost never cooled with fans, but even so they rely on convection currents to work properly and if the intake and outlet holes are covered over by dust then they ll quickly die. If you want to put a TV in a shop, you re best off making a box around it out of sheet metal. Don t put any holes in the box except a sealed grommet to pass the power cord in. Put a tiny desk fan or something inside to make air flow. The air will transfer heat to the metal box and provide cooling. Interesting ….. what about computer monitors (i.e. not the computer itself but the monitor). Any problem there? I’ve always (at least for the last 10 years or so)had a cassette deck (yep, still got one), CD player, computer, TV (which doubles as a computer monitor), and used to have a VHS deck (became obselete). Yep, they got dusty….but I still never had a problem. Actually I never gave it much thought…if they give it up I’ll replace them. Keep a trash bag over mine. Keeps the dust out and when it craps out it’s already in the trash bag.